Deborah Fahy Bryceson is an economic geographer at the University of Glasgow. Her work is concerned with African livelihoods, mobility, and settlement in transition, notably with respect to the processes of deagrarianization and urbanization. Largely missing from the press reports and general debate, however, was any acknowledgement of three decades of agrarian change in the South, which had profoundly altered the nature of global agricultural food production. Much of what was headlined as breaking news was, in fact, the logical outcome of already well-established vulnerabilities that analysts and media observers had failed to note. 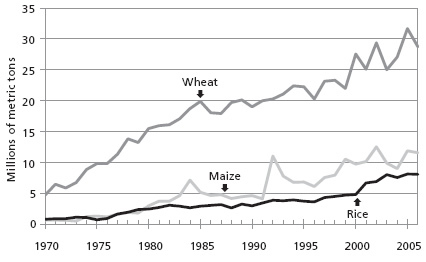 The incidence of agrarian upheaval and inadequacy of staple food supplies was most acute in Sub-Saharan Africa. The following discussion probes why the fault lines of a world food crisis have publicly been recognized only recently, and how African smallholder peasant agriculture and the changing character of African staple food demand fits into the wider global picture. Why were signs of escalating global food supply constraints ignored despite international donor agencies’ professed concern with alleviating African rural poverty? To answer these questions, it is useful to revisit the development perspective that prevailed prior to the first global oil crisis in the 1970s. In Sub-Saharan Africa, European colonial annexation in the late nineteenth century molded the multitude of different agrarian, pastoralist, and occasionally even hunter-gatherer groups into peasant producers largely through the imposition of residential hut and poll taxes. This forced rural producers to earn cash for tax payment, generating the foundations for the continent’s agricultural export economy based on the beverage crops of coffee, cocoa, and tea and several food and fiber crops including peanuts, cashew nuts, tobacco, sugar, and cotton. Peasant cash crop producers provided the political force behind the national independence movements that swept the African continent in the 1950s and formed the foundation for the economies of the newly independent countries that came into being in the 1960s. During that decade African countries’ economic performance was promising. African and Asian countries were parts of the “third world” destined for eventual achievement of the first world’s higher standards of living. The improving staple food yields, however, were short-lived. In the mid-1970s, the economic shock of the oil crises undermined African peasants’ prospects and their national economies. Most African governments had established state enterprises to market the widely fluctuating stocks of commercial staple food crops produced by peasants. Peasant farmers in many countries had received fixed returns regardless of their distance from urban centers of staple food demand. This, in addition to peasant farmers’ subsidized crop input packages, had created incentives for peasant grain production. But at the time of the oil crisis, as the cost of surface transport escalated, state finances became severely stretched. This marked a turning point in the tripartite relationship between peasant producers, state infrastructure providers, and the global market. Meanwhile, African governments became heavily indebted. By the end of the 1970s most were forced to seek debt financing from the IMF. In doing so, the World Bank and IMF gained leverage and eventually the lead in African policy formulation, a lead that African governments, in the main, have failed to regain. In the context of emerging neoliberal ideology, connected with the rise of Reagan and Thatcher on the world stage, the World Bank diagnosed that the continent’s decline was due to the over-involvement of African states in their economies. Structural adjustment programs (SAPs) had the two-pronged agenda of reducing the role of the state in the economy and cutting back on state-provisioned infrastructure and services. SAPs spelled the end of attempts to raise peasants’ staple food yields. Fertilizer and seed subsidy packages were retracted. FAO statistics in chart 1 show an upward trend in grain output on a par with South Asia, which then leveled off in the 1980s—while South Asian yields continued to increase—as subsidized crop input programs collapsed and yields on unfertilized soils declined.9 Peasant farmers, having seen the difference that fertilizer application could make, deeply resented this setback, blaming the state for the removal of subsidies. Subsidies and support for export crops were similarly affected. Economic liberalization policies enforced by international financial institutions led to the dismantling of the market and productive service infrastructure that had ensured timely marketing and crop quality control for Africa’s major cash crop exports since the colonial period.10 African peasant farmers’ output of export crops eroded significantly. Source: FAO statistics cited in WDI indicators, 2009, http://publications.worldbank.org/WDI. The highly capitalized, fossil-fuel reliant nature of North American and European farmers enables them to out-compete Asian and African farmers in the global market for most commercial export crops.18 Displacement of African and Asian farmers in commodity markets is inevitable in the absence of increased capital investment in their agriculture. As the history of North America, Europe, and Japan demonstrates, there may be nothing inherently problematic about such displacement if the producers are both willing and able to find viable alternative livelihoods. But given the massive numbers of potential “economically displaced people” and the unknown consequences of such a historically unprecedented global tidal wave, the belief that world commodity markets will eventually optimize production and welfare for the world’s poor has to be treated with skepticism. The gap in value added between African and Asian farmers and those in the United States and Europe is not simply a difference in economic capability and output. Rural ways of life, which have evolved over the millennia in Africa, have been finely tuned to the local environment, social consensus, and political balance. The undermining of the local economies of rural communities due to sudden market shocks or gradually worsening terms of trade, market disincentives, and obstacles has already and will continue to undermine personal welfare, leading to social upheavals and political destabilization. There has been a surge in a variety of non-agricultural activities, notably trade and mining, in place of export crop production. Activities formerly done on a local exchange basis or as a contribution to village life are increasingly performed for cash. Payment for various categories of family labor has become more common. Wives, as well as youth and even in some cases children, may join male heads of household in working for cash. Households have gained multiple income streams, which are not always pooled within the household. Work experimentation is widely prevalent. Engagement in non-agricultural activities is no longer reserved for the agricultural off-season. Individuals may pursue two or more livelihoods simultaneously or serially switch from one activity to another in a process of experimentation, trying to offset losses in one area with gains in another. In many rural areas local purchasing power has imposed severe constraints such that people, especially youth, are motivated to be more mobile or migrate in order to facilitate their trading or other occupational activities. The upsurge of trading activities and the role of youth and women in trade has overturned age-old patterns of the agrarian economy and the traditional transfer of farming skills from one generation to the next. In many parts of Africa, non-African ethnic minorities—Asians in East Africa and Lebanese in West Africa—have historically played a significant role in rural produce marketing. After independence, non-African traders tended to be displaced by the establishment of state marketing agencies. As these agencies were dismantled under SAPs, African traders gained a greater scope for their operations although they were severely hampered by lack of capital for investment. As a result, most African rural traders have been restricted to easy-entry, overly competitive petty trade with extremely slim margins. Sometimes, the most lucrative alternative to farming is mining. Employment in large-scale gold mining in Southern Africa has declined in importance, but the distress of continent-wide economic recession during the 1980s prompted many farmers in mineral-rich areas to start prospecting for gold, diamonds, and other precious and semi-precious stones in and around their villages despite government bans on mineral excavation. Small-scale miners proliferated in already well-established mining countries like Ghana and Zimbabwe, in countries without a strong historical legacy of mining such as Tanzania, and in countries where war-torn circumstances propelled growing numbers into lucrative mining as exemplified by Angola, Sierra Leone, and the Democratic Republic of Congo. Rural dwellers’ efforts to find alternatives to low-yielding commercial agriculture generally do not represent an abandonment of agricultural production. Rural households retain their foothold in agricultural production to provision their subsistence food needs.22 The reality is that alternative non-agricultural livelihoods are usually experimental, with the risk of low or even no returns. Reliance on subsistence agricultural output is the vital insurance that rural households need to undertake their risky economic ventures into the unknown. While rural households try to achieve a balanced portfolio of productive activities, with subsistence food production as insurance against failure, no such balancing efforts are taking place at the national level. African countries’ domestic staple food markets are getting increasingly less able to meet the rising food demand emanating from their rapidly expanding cities. Over the last three decades, Sub-Saharan Africa experienced an exceptionally strong urbanizing trend, which, contrary to economic models, was not associated with economic growth or industrialization.23 Urban migration is propelled by the push from a declining rural peasant sector rather than from the pull of rising urban productivity. Most of Africa’s urban economic activity is taking place in the informal sector, where livelihood experimentation with low and uncertain earnings, as described above for rural areas, is the norm. Not surprisingly, in view of the declining staple food yields of the continent, African urbanization has gone hand-in-hand with increasing food imports.24 Wheat, which is not a traditional African grain crop, is overwhelmingly consumed in urban settings. Its rising import trend mirrors the growth of African urban populations. Maize was not a traditional African staple food, but is now grown widely and has become a very important component of both rural and urban populations’ food consumption, particularly in East and Southern Africa. While its overall import trend is upward, it is subject to variation depending on domestic harvests. Source: FAO trade statistics, 2009, http://faostat.fao.org. Economic liberalization policies of the 1990s and the implementation of the WTO Agreement on Agriculture have had a marked impact on food import patterns. For example, in Senegal and Tanzania there has been strong growth in imported rice and wheat mainly to supply urban areas. 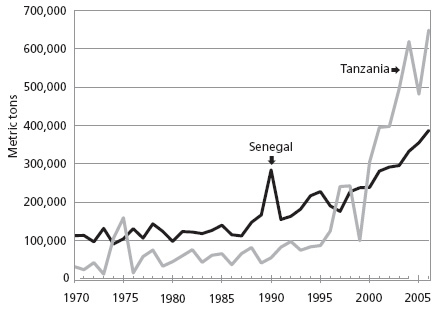 The surge in Tanzanian wheat imports is particularly striking (see chart 3). The “upgrading” of urban diets with “preferred” cereals, as opposed to local grains and root crops, greatly increases dependence on imported food, which has to be purchased with African nations’ scarce foreign exchange. When international staple food prices rise dramatically, as they did in 2008, urban food crisis and food riots can spread rapidly in cities where there is little or no recourse to domestic farm production. Comparing the 1970s with the present, it is readily apparent that the state of African agriculture is far worse now. The continent’s smallholder peasantries have been weakened for decades by a lack of agricultural investment and poor producer incentives. They are producing in an ever-more erratic world economy. Meanwhile, the volume of commercial staple food demand has been spurred by rapid urbanization, compounded by increasing reliance on foreign importation of rice and wheat as urban dwellers’ preferences are swayed towards western dietary patterns. The preceding graphs and narrative document the eroding economic sustainability of African peasant agriculture since the 1970s oil crises. The conclusion that some policy analysts and others draw is that smallholder agriculture is exceptionally backward and should be replaced by more efficient agriculture. There are different visions of agrarian directions, some being more open-ended than others. Paul Collier argues for scientifically advanced agriculture using biotechnology.27 The World Bank advocates the realization of economies of scale.28 Invariably, these trajectories infer extensive displacement of peasant smallholders given their historically disadvantaged capital assets. Despite their avowed poverty concerns, African government officials and development agencies alike tacitly tend to accept smallholder labor displacement as necessary for agricultural modernization. Sub-Saharan Africa has never had a period for consolidation of its productive capacity and has been continually open to commodity price fluctuations in the global economy, buffeted by oil price rises and sharp agricultural commodity price fluctuations without the cushion of government subsidy.29 Despite the survival of peasant agriculture for millennia, the continent has been witnessing its eclipse ever since the 1970s oil crises. African small-scale peasant producers now compete with heavily subsidized large-scale, often corporate, industrialized farming in the world market. If it is accepted that African smallholders have faced an exceptionally hostile global market and policy context for the last three decades, is it feasible and worthwhile for national governments and donors to try to resuscitate smallholder agricultural productive capacity now? Answering this question requires distinguishing African producers’ radically different circumstances compared to those before the oil crisis. Processes of deagrarianization and depeasantization are already advanced in rural areas across the African continent. Rural economies are more diversified and trade-oriented. The average age of rural farmers has increased as youth have migrated elsewhere to pursue non-agricultural activities. Nonetheless, the sense of rural home areas continues to prevail not just for emotional reasons, but because migrants are well aware of the vital importance of a fallback to agricultural subsistence at their rural place of birth. These social affinities and attendant political loyalties have to be taken into account in policy formulation. Despite more than two decades of experimentation with non-agricultural work, rural producers face uncertain livelihoods. A laissez-faire perspective, arguing that smallholder farmers should simply find work elsewhere and let small-scale agriculture disappear, amounts to gross negligence in the absence of any policy provision for alternative non-agricultural employment. The politically destabilizing effects of agrarian labor displacement in economies without established industrial growth trajectories or other alternative employment opportunities militate for concerted efforts to raise smallholders’ productivity. This requires research, on-the-ground assistance, and infrastructure investment. Historically, peasantries have formed the demographic, cultural, and political bulwark of African nation-states, providing the ethical and social foundations upon which national stability has rested. Thus for the sake of human welfare, agricultural productivity, and national stability, smallholder agriculture is preferable to large-scale, highly capitalized agriculture. Government and donor policies that serve to consolidate large-scale agriculture at the expense of smallholder agriculture have heavy costs globally for three main reasons. First, the world’s oil production is now peaking amidst rising oil demand from Asia. Expanding long-distance value chains and large-scale agriculture, which rely heavily on oil, do not augur well for energy conservation. Large-scale agriculture is exceptionally energy-intensive and relies on the transport of commodities over exceptionally long distances. Second, experts are increasingly concerned with the disease hazards of large-scale intensive factory farming as exemplified by the avian influenza virus and its link to intensively farmed poultry. It has been observed that while factory production of animals is often associated with the source of such viruses, it is the large-scale farms’ proximity to small-scale producers, lacking sufficient bio-safety measures, which fans the spread of such disease. In the longer term, the incidence of disease in intensive farming could be compounded by the temperature changes and unpredictable and erratic weather associated with global warming. Third, given the uncertain course of global warming on Africa’s weather patterns, intensive large-scale farming is an especially high-risk form of agriculture that concentrates reliance on a restricted number of plant and animal species. The crop biodiversity offered by extensive small-scale farming is likely to be at much lower risk for ensuring a continuous supply of food for the global population. In the World Bank’s World Development Report 2008 the market is posited as the arbiter. Smallholder farmers who cannot meet the rigors of the global market are exhorted to achieve economies of scale through producer organizations, which are deemed to facilitate their ability to meet the delivery specifications of global value chains. Failing this, they should seek alternatives, namely contract farming, wage labor with large-scale agricultural units, or employment outside the agricultural sector. The latter group will engage in rural non-agricultural income-generating activities or alternatively, migrate to urban areas. The World Bank along with other donors advocate social protection policies that serve as safety nets to alleviate the losers’ inevitable economic misery. In a better-late-than-never attempt to resuscitate the African agricultural advances that SAPs short-circuited in the 1980s, donors are now scrambling to think of ways of boosting smallholder agriculture.31 The Gates Foundation’s Alliance for a Green Revolution in Africa (AGRA) program is mobilizing to invest heavily in improving agricultural research, extension, and input packages for African smallholders. It is too early to evaluate the program and its impact on small-scale African agriculture. However various environmental and social activists suspect that AGRA investments are intended to create new markets for western chemical and agro-industries, encouraging African farmers’ dependence on non-sustainable agricultural inputs and favoring larger more entrepreneurial farmers at the expense of others. Certainly, there is a need to be cautious and to ensure that the recommended inputs and practices are carefully researched and environmentally suitable for their target areas. Environmentally sound practices (including organic) are central to any long-term and sustainable solution to food production and national food security. However, it would be a mistake to hold back the long-delayed investment in research and extension, now beginning to be offered to African smallholders, which may fall short of environmental sustainability goals. All efforts are needed at present and they should be seen as complementary rather than competing with one another. African farmers, who have been deprived of research, extension, and marketing support for decades, are eager to increase their yields and sustainability. They are in the best position to experiment with what works for them. African producers have demonstrated enormous productivity and creativity in non-agricultural activities. These should be supported with policies aimed at non-agricultural skill training and efforts directed at building stronger linkages between agriculture and non-agricultural activities in the rural areas. Much of the viability of rural non-agricultural activities relies on a thriving agricultural sector to provide both purchasing power and inputs for non-agricultural activities. Farming remains the vital material foundation upon which the poor can engage in non-agricultural experimentation. Contrary to the view that peasant smallholders are backward, unproductive agricultural producers representing an archaic way of life, the preceding sections have argued that rural trends over the last three decades have affirmed the ingenuity and determination of diversifying small-scale rural producers, even in circumstances of protracted capital and infrastructural deprivation. In the current international financial crisis and hiatus in lending, it is doubtful that the world’s population at large could survive such draining circumstances with the fortitude that African farming households under analogous circumstances have endured for three decades. They managed to do so because their subsistence food production provided them with a means of survival independent of reliance on markets. Ironically this subsistence component of their livelihoods is what generally evokes the most criticism and derision by western and educated African commentators. In an age of global financial crises, perhaps African smallholders’ economic wisdom directed at combining conservative staple food survival strategies with highly adaptive and flexible commercial livelihoods can finally be appreciated. The food price scare has dramatized the issues. There is a realization on the part of western donors that declining numbers of small-scale African farmers and rising amounts of African food aid and urban food importation constitute a precarious economic and political situation. A supply-side perspective arguing for “large-scale agriculture for economic efficiency” is beginning to be challenged by the demand side and an outlook that reaches beyond poverty alleviation toward durable poverty eradication. Ironically, much Western donor intervention over the last three decades has undermined the food-producing capabilities of the African continent. SAPs starved the peasant sector of capital investment and productive infrastructure, and economic liberalization exposed a weakened smallholder sector to competition from highly subsidized large-scale Northern farmers, while encouraging staple food import dependency in African cities as well as migration to the cities. Perhaps the shock of the global food price and financial crises will open African governments to the view that African smallholder peasants have agricultural potential and will impart caution against trusting everything to the market. The continent needs enlightened donors and African governments willing to substitute food aid and food imports for equitable investments in African smallholder agriculture. ↩ R. Walden, “A Tsunami of Hunger: Food Riots Hit Countries in Africa, Asia and Haiti” Huffington Post (April 18, 2008). 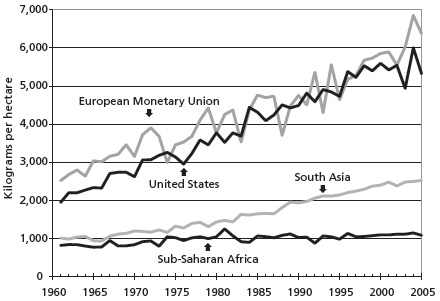 This followed revelations contained in USDA assessments of global staple food reserves: B. Meade, S. Rosen, and S. Shapouri, Energy Price Implications for Food Security in Developing Countries (GFA-18, USDA, Economic Research Service, June 2007). W. Coyle, “The Future of Biofuels,” Amber Waves 5, no. 5 (USDA, Economic Research Service, November 2007). ↩ The Economist (December 8, 2007) argued that between 1974 and 2005 real food prices dropped by three-quarters on world markets. ↩ Fred Magdoff, “The World Food Crisis,” Monthly Review, May 2008. ↩ For documentation about how South Africa’s peasantry was displaced far earlier by larger-scale, capitalized farmers of European descent see C. Bundy, The Rise and Fall of the South African Peasantry (London: Heinemann Educational Publishers, 1979). ↩ T. Shanin, “Introduction,” in T. Shanin, ed., Peasants and Peasant Societies (Harmondsworth, UK: Penguin, 1976), , 11-19. ↩ D. F. Bryceson, Food Insecurity and the Social Division of Labor in Tanzania, 1919-1988, (London: Macmillan, 1990); Oluoch-Kosura and J.T. Karugia, “Why the Early Promise for Rapid Increases in Maize Productivity in Kenya was not Sustained,” in G. Djurfeldt, et al., (eds. ), The African Food Crisis (Wallingford, UK: CABI Publishing, 2005), 181-96. ↩ G. Andrae, and B. Beckman, The Wheat Trap: Bread and Underdevelopment in Nigeria (London: Zed Books, 2008). ↩ Asia’s Green Revolution efforts had started almost a decade before those of Africa and had not only registered success but also achieved sustainability by the late 1970s. With national economies strengthened by reliable domestic food production, they were far less vulnerable to debt and the imposition of SAPs in the aftermath of the 1970s oil crises. ↩ S. Ponte, “Brewing a Bitter Cup: Deregulation, Quality and Reorganization of Coffee Marketing in East Africa,” Journal of Agrarian Change 2, no. 2 (2002): 248-72. ↩ L. Cabral, “Funding Agriculture: Not ‘How Much?’ but ‘What For,’” ODI Opinion 86 (October 2007). ↩ In 2006, almost $286 billion was paid to OECD farmers in the form of subsidies, which amounted to approximately 27 percent of their total farm receipts (OECD). ↩ P. Gibbon and S. Ponte, Trading Down (Temple University Press, Philadelphia, 2005). ↩ Large-scale farming is defined here as capitalized agricultural enterprises operating as businesses often of a corporate nature, using wage and salaried labor, deploying intensive agricultural techniques to maximize commercial output. Smallholder farming on the other hand entails family labor producing for commercial sale and household subsistence. ↩ Agriculture value added (includes forestry, hunting, and fishing as well as crops and livestock production) is net output after adding up all outputs and subtracting intermediate inputs for the sector. Source: World Development Indicators 2009, http://publications.worldbank.org/subscriptions/WDI/WDI.html [Webmaster note: data is behind a paywall]. ↩ World Development Indicators 2009, http://publications.worldbank.org/subscriptions/WDI/WDI.html [Webmaster note: data is behind a paywall]. ↩ This is increasingly the case as biotechnology conquers some of the barriers to tropical plant production in temperate climates. ↩ D. F. Bryceson, “De-Agrarianization and Rural Employment in Sub-Saharan Africa,” World Development 24, no. 1 (1996): 97-111. D. F. Bryceson, “African Peasants’ Centrality and Marginality,” in D. F. Bryceson, C. Kay, and J. Mooij, Disappearing Peasantries? (London: IT Publications, 2000), 37-63. ↩ D. F. Bryceson, “Multiplex Livelihoods in Rural Africa,” Journal of Modern African Studies 40, no. 1, (2002): 1-28. ↩ For reviews of depeasantization worldwide see: R. Araghi, “The Great Global Enclosure of our Times,” in F. Magdoff, J. B. Foster, and F. H. Buttel, Hungry for Profit (New York: Monthly Review Press, 2001): 145-60; R. Araghi, “Global Depeasantization: 1945-1990,” Sociological Quarterly 36, no. 2 (1995): 337-68. ↩ D. F. Bryceson, “The Scramble in Africa,” World Development 30 no. 5, (2002): 725-39. ↩ D. F. Bryceson, “Fragile Cities: Fundamentals of Urban Life in East and Southern Africa,” in Bryceson, D. F. and D. Potts (eds. ), African Urban Economies: Viability, Vitality or Vitiation? (London: Palgrave Macmillan, 2006). ↩ J. Tabi, W. H. Howard and T. Phillips, “Urbanization and Food Imports in Sub-Saharan Africa,” Agricultural Economics 6 (1991): 177-83. ↩ There is debate about the reasons for the meteoric increase in oil prices in 2008, with some pointing a finger at the influence of speculative trading. See http://www.gulfnews.com/BUSINESS/Oil_and_Gas/10225162.html. ↩ A gathering of agricultural ministers from ninety-five countries meeting in Madrid in January 2009 stressed the perilous state of world agriculture and the need for more investment to avoid soaring food prices (“The Poor Still Face Hunger,” New Scientist, January 31, 2009). ↩ P. Collier, “The Politics of Hunger: How Illusion and Greed Fan the Food Crisis,” Foreign Policy, November-December 2008. ↩ World Bank, World Development Report 2008: Agriculture for Development (Washington, DC: World Bank, 2008). ↩ J. I. Round, Globalization, Growth, Inequality and Poverty in Africa, Research Paper 2007/55, UNU-Wider (Helsinki, 2007). ↩ At a recent UN summit, Jacques Diouf, Director-General of the FAO, called for $22 billion pledged by governments since June 2008 to be released to address rising global food prices (“The Poor Still Face Hunger,” New Scientist, January 31, 2009). ↩ A. Dorword, Rethinking Agricultural Input Subsidy Programmes in a Changing World, paper prepared for the Food and Agriculture Organisation (London: School of Oriental and African Studies, April 2009).